Ever had a brilliant idea for a business, but not had the confidence or knowhow to make a go of it? We speak to mum Rachel Roberts about why she was inspired to start her own fashion business – and how she went about it. I started life as an accountant working on big corporate investment projects. Over the years I moved into corporate strategy where I had a senior role in a commercial bank. Unfortunately the banking crisis resulted in me being made redundant while on maternity leave with my second child. Deciding it was time for a change of direction, I enrolled on an MBA course at Lanaster University, and while I was studying I got the idea for Rachel Wears. What is Rachel Wears, and what inspired you to start it? 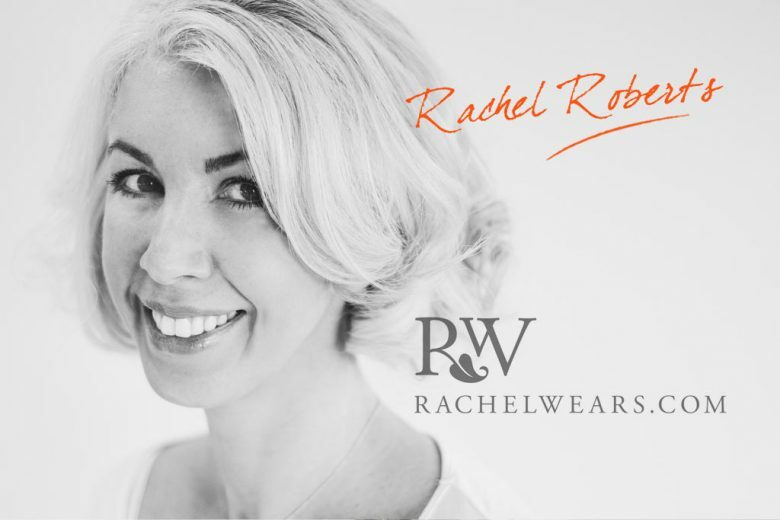 Rachel Wears provides high quality, easy to wear wardrobe staples for today’s busy women – all ethically produced in the UK using only the finest quality fabrics and yarns. Once I reached my late thirties I found it was getting harder and harder to shop for clothes I liked. Quality was poor, choice was limited and everything was either ‘dressy’ or ‘casual’. I was also increasingly concerned with the ethics of the fashion industry, and the environmental damage that fast fashion is doing to the planet. I needed clothes that could be dressed up or down, and be mixed and matched to provide me with a wardrobe that would last longer than a season. I love to look good and I have always enjoyed fashion but like most women don’t have the time or the money to buy a new wardrobe each season. What skills and experience have you used from your career in your business? My business background certainly helped with putting the business plan together, and as an accountant I had the skills to put together budgets, cash flows and profit forecasts. So my corporate career certainly hasn’t gone to waste. How did you go from spotting a business opportunity to actually rolling your idea out? First I had to establish whether I could actually get garments made in the UK. That took quite a lot of determination to research. The few remaining garment factories tend not to have websites, so you can’t just Google them. I did some initial research on the web, and then got on the phone to try and track down suppliers. It wasn’t easy but I was determined to do it. Once I knew the manufacturing capability was there, I knew my idea had legs so I put a budget and business plan together and we were off. What are the biggest challenges you’ve faced, and how have you dealt with them? We trade online (rachelwears.com), but the internet is so busy these days that getting your brand, and everything it stands for, in front of your target market on a small budget is a challenge. We are using a number of luxury online market places to add to our own website platform, and we are also engaging in social media to get the message out to as many people as possible. What have been your biggest successes so far? We showcased our debut collection at Manchester Fashion Week on Easter Sunday and we were bowled over by the positive reception we got. I guess I didn’t really consider myself to be a designer until that point. I still think of myself as a business woman first and foremost. How have you grown your business? What’s worked for you and what hasn’t? Its very early days for us still, as we only launched in March this year, and as a start up we have to work to a strict budget. So for the moment we are concentrating on building a loyal customer base. I would certainly say that traditional print advertising has not worked for us in terms of driving sales, whereas social medial has proved to be both cheaper and more effective. We will soon be looking for private equity funding to take us to to the next level. That will be an important step in growing the business. What makes Rachel Wears different? As a brand we are honest, ethical and service-orientated, plus we are committed to British manufacturing. Lots of big clothing brands claim to be British, but actually manufacture overseas which deliberately misleads the customer. That’s a cardinal sin in my book! Who is your ideal customer and how do you help them? She’s a discerning woman who needs a high performance wardrobe to take her from the school gates to the office and out for dinner afterwards. But she also wants to buy from brands who place high importance on ethics and sustainability. We’re helping our customers by providing high quality wardrobe classics that won’t date. Everything can be dressed up or down and accessorised to suit every occasion, plus they know it has been made ethically in the UK. We want to become a household name in the world of online ladies wear. It’s not quite as easy as I thought it would be! Sometimes I feel that I work 24/7 with multiple hats on, but I am able to take the kids to school and pick them up most days – even though they have to put up with me spending more time on my laptop and phone than I would ideally like when they are around. I try to keep 4-7pm as family time in the week, and then work again once the kids are in bed. What advice do you have for other ambitious business mums? I would advise anyone to follow their dream. It is really hard to maintain a career after children, so you need to do something you love, and working for yourself does provide flexibility that is invaluable for women with families. A word of caution though – if you really want to make a success of your business, you need to put serious effort into it. It’s not for the faint hearted, but if you are determined to make it work, you will. You can browse and buy from Rachel’s collection on her website.